With excellent pricing and outstanding service, Pacific Debt is an ideal choice for reducing your payments with excellent debt settlement solutions. When your debts become an unmanageable problem, Pacific Debt’s expert debt negotiators can help you find the right solution. Thanks to its emphasis on negotiation and settlement, its team of experts can assist you when it comes to dealing with creditors and collectors, as well as helping drive down debt that has ballooned out of control due to late fees and high interest rates. The company has over a decade of experience in the field, and employs a team of debt negotiators and counselors that guide you through the whole process of settlement and management. Thanks to its strategy of focusing on one outstanding debt at a time, the company can help you successfully tackle several sources of debt without placing a heavy strain on your budget and bank account. Additionally, with strong and friendly customer support and an impressive collection of educational resources, Pacific Debt can empower you to look after your own personal finances. This company excels in a comprehensive approach that's necessary to truly deal with debt. The company’s focus on negotiation and settlement, while not ideal for all customers, allows the company to truly pay attention to the small details and always act in the best interest of the customer. Pacific Debt will guide you through the whole process of negotiation and settlement, and will not collect any fees until you reach a successful outcome. Once you sign up, the company will assign you a personal account manager, who will interact with creditors and collectors on your behalf to negotiate more reasonable amounts and payment solutions. Moreover, because the company does not collect any monthly or upfront fees, it transparently acts in your best interests. The company’s fees are near the lower end of the industry spectrum, between 15% to 25%, although the exact percentage might vary by state. Pacific Debt focuses almost exclusively on providing debt negotiation and settlement services. This provides an efficient and effective means to deal with mounting debt. The company’s debt negotiators and experts have a proven track record, as well as a deep knowledge of the industry. This allows it to, on average, reduce customers’ debt by 30%, and in many cases even more. The company will also advise you on the best course of action for your situation, even if that does not always align with the services it offers. Because it does not charge for consultations and even for initial work to help you negotiate your settlement, you can be sure it is always acting to serve your interests. If you reside in San Diego, it can connect you with one of its trusted partners for debt consolidation services. To start your debt management program with Pacific Debt, pick up the phone or fill out a form on the website to request a free consultation. From there, one of the company’s debt specialists will review your case, and work with you to determine the best course of action. It is important to keep in mind that this company generally works with customers that have $1,000 or more in outstanding debts. When it comes to managing debt responsibly and effectively, a key component that often gets overlooked is education. Pacific Debt has made knowledge a central element of its debt relief services. The company’s webpage is full of outstanding educational tools and reading material that includes information about debt, credit scores, and other personal finance topics. Additionally, the company hosts a blog that features insightful posts about current issues and important debt-related developments. Outside of its educational resources, it is also easy to get started with Pacific Debt. While the company operates out of San Diego, California, it provides its services nationwide. The only requirement is that you have $10,000 or more in aggregate debt—meaning the total of all your outstanding obligations. Otherwise, they will offer consultations to any potential customer, and help determine the best course of action for any situation that may arise, regardless if it includes working with them or not. The personalized level of service the company offers is quite impressive, with personal account managers handling every case and assisting throughout a process that can at times be complex and overwhelming. Even before you start your debt management program, a Pacific Debt team member will be in contact with you to help you manage your creditor calls and prepare all the necessary paperwork for your upcoming negotiations. The company also offers a service that is an interesting take on debt consolidation. While it will not directly offer consolidation loans, the company helps you consolidate your debt payments by structuring your program so that instead of paying all your debts simultaneously, you focus on one outstanding amount at a time. While this might take slightly longer in some cases, it also means that you can create a plan that works with your budget and will avoid putting you in financial straits. Pacific Debt is willing to deal with a broad range of debt. While it exclusively works with unsecured obligations—those that do not require any collateral—the variety of debt it services is still impressive. It works with customer debt that includes credit cards, medical bills, unsecured personal loans, retail debt, repossession and accounts in collections. The company also does not limit you to working on a single source of debt at one time. Instead, they will review all your outstanding obligations before helping you devise a plan that will ensure you pay all debts down to zero without putting an unnecessary strain on your personal finances. Pacific Debt's pricing is extremely competitive when compared to industry standards. 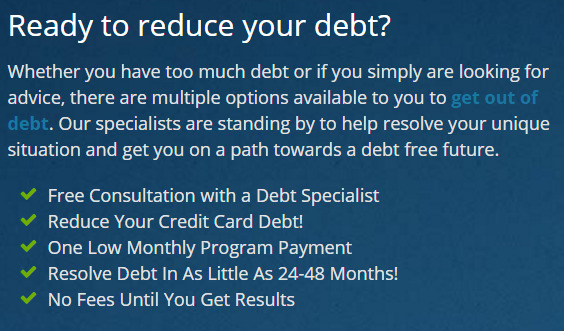 A pricing example from their site (above) shows that their programs are significantly cheaper than other debt solutions, both in terms of monthly fees and in terms of total amount paid. Customer service is one of Pacific Debt’s strongest features. The company has crafted its entire debt relief solution to include personalized assistance throughout the entire process. The company can be reached via email, telephone, and in-person if you are based in Southern California. The company operates 5 days a week during normal business hours. When you first sign up, the company will assign an agent responsible for preparing the process of negotiation by assisting with your creditor calls, as well as helping gather the required paperwork. Once you start the negotiation process, you will be assigned a personal account manager who will help guide you and update you on any new developments. Overall, the company’s representatives are incredibly knowledgeable and helpful. Agents are able to answer questions, and respond promptly to e-mail inquiries. Pacific Debt is focused on providing a customer-first approach to debt relief. While dedicated almost exclusively to debt negotiation and settlement, the company offers customers a personalized and transparent service. The company’s debt relief process is straightforward and geared toward letting customers repay their debts within 24 to 48 months. Additionally, the company is focused on providing its customers with useful educational resources to empower more responsible personal financial management. Also, its level of customer service makes it an appealing option for any potential client. The company provides constant assistance and helps guide customers through the entire process of debt management. From assigning an agent to help with preparations for debt negotiation, to a personal account manager who actively negotiates and updates the status, Pacific Debt ensures that you are always in the loop and in total control of your debt consolidation process. Pacific Debt was founded in 2002 by two San Diego natives who noticed the increasing debt problem in America. The company was conceived on the principle of empowering customers and helping people deal with problems that can be incredibly damaging and life-altering. It works with customers nationwide to help fix their credit and believes in providing a customer-centric approach to debt settlement and relief. Pacific Debt has assisted customers with settling millions of dollars every month. The company has an A+ rating from the Better Business Bureau, and is an accredited member of the American Fair Credit Council.